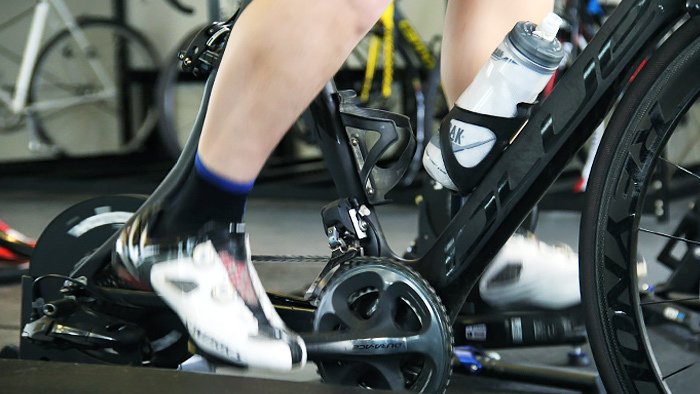 The indoor trainer is a dreaded but necessary part of many cyclist’s training program. While there are times in the season that an alternative activity—running, hiking or skiing—can fit well into a plan, sometimes there is a need to get on the trainer and complete a session. While long and steady base miles can work out well when the weather is fine, a different approach is needed to get the best out of a trainer workout. Adding in intensity, even during the early season, can make up the training load where volume is missing. Pedaling drills are also a great way to make the time go faster. These five sessions will add some spice to your weekly ride, while adding some benefit to the session that you might not get from riding outside. While single leg drills should probably be avoided on the open road, the trainer is the perfect time to practice some single leg pedaling. Single leg drills are great at strengthening the muscles that don’t normally get worked on the bike with two legs; hip flexors in particular. Unclip one foot and leave it dangling to the side. If you’re unsteady you can use a chair to rest your foot on. With the active leg, build up to completing a minute of single leg pedaling on each side. Keep the cadence high in order that you don’t overly stress the hip flexors when you’re getting started. You’ll notice that the upward section of the pedal stroke becomes much more difficult, and it’s here that you’ll have to focus on keeping your cadence up. Many races are won by well-timed accelerations, rather than all-out power; think about Mark Cavendish timing his “jump” to perfection. Practicing riding at high cadence can improve your acceleration, and also allow you to follow moves during the critical part of a race. For road cyclists, this may mean riding at your Functional Threshold Power (FTP) while maintaining a cadence of 110 rpm or above. Cadence ladder drills are an easy way to pass the time on the trainer, and also give you a chance to improve your smoothness at a higher cadence. Starting at a comfortable cadence of 80 rpm, increase your cadence by 10 rpm every 2 minutes until you get to 120 rpm. Repeat three times to begin with. For progression, try spending 4 minutes at each cadence, or pushing your limits by seeing how fast you can turn your legs without bouncing right off the trainer. High level track cyclists can comfortably spin at 160 rpm. What’s your limit? Most cyclists head to the gym during the off-season to build strength and gain some resilience to injury. Strength work can also be achieved on the bike with muscle tension intervals. Settle into a cadence of 50-55 rpm, and hold it for 5 to 6 minutes. Repeat this three times for the first week, before building up to a continuous block of 20 minutes at the low cadence. Not only are these a great way to improve strength, they also aid in the recruitment of more fast-twitch muscle fibers which will help you out in sprinting and anaerobic efforts later in the season. The final benefit of muscle tension work brings your glutes into play: While most cyclists can get away with using mostly quadriceps and hamstrings on the bike, the lower cadence will really activate the gluteus maximus, giving you another powerful muscle group to work with. Sweet spot training is a great way to spend time on the trainer. When you only have an hour to ride, there is not much benefit to riding at a traditional base pace: you simply cannot do the volume to get enough benefit. Upping the pace to roughly 90 percent of your FTP (for new riders: think of the pace you can ride at while only just sustaining a conversation) will mean you get a better workout without incurring a huge amount of fatigue. Start your training plan with three intervals of eight minutes at your “sweet spot,” and build this up until you’re fitting 45 minutes at this intensity during your hour inside. Holding above-threshold power on the trainer can be tortuous. The seconds tick slowly by as your legs fill up with lactic acid. But you can get a similar workout load and break up the monotony by splitting your workout into microbursts. Try holding 45 seconds at your Functional Threshold Power (FTP) followed by 15 seconds of rest. Repeat this for 10 minutes, and you’ll find that you’ve spent 7.5 minutes at threshold with only a fraction of the mental energy being spent. Do two to three sets of these to get started. All these sessions have plenty of room for progression as your time and fitness allows. If you’d like to try any of these trainer workouts for free and/or export them to your TrainingPeaks compatible device or app click HERE.